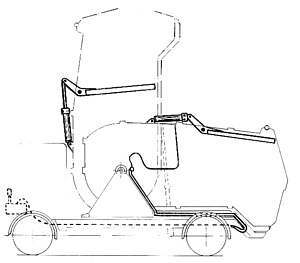 Among the unique features of the Shelvoke & Drewry Freighter were the low entry level for the driver achieved by the front chassis extension being lower than the chassis. The transversely mounted engine gave an exceptionally clear view for the driver, whilst the epicyclic gearbox and tiller steering simplified driving the vehicle. Hydraulically operated tipping gear meant that discharging the refuse involved no physical effort. Automatic lubrication of all working parts reduced maintenance requirements. 2. The Fore & Aft Tipper. 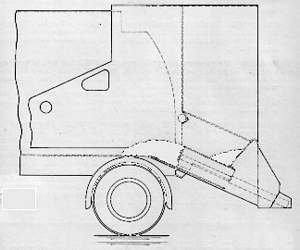 Before the Second World War Shelvoke & Drewry introduced the Fore & Aft tipper on the Mk II Freighter chassis. The concept came from Faun in Germany and was used under licence. After the War there was a significant move towards a decrease in the density of refuse as coal fires became less popular and packaging of goods increased. 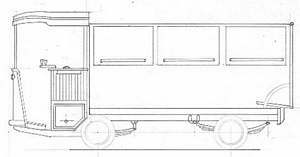 So with the introduction of the 'W' type chassis the Fore & Aft body was offered and soon became very popular. The body was mounted on an auxiliary sub frame which locked to the chassis when forward tipping to consolidate the load. From 1951 a hydraulic pressure plate mounted in the roof of the body was also offered to give additional compaction of the load. This was known as the Power Press version. For discharging the load the auxiliary sub frame was unlocked from the chassis and pivoted on the rear chassis extension as shown above. Although the use of a sub frame created additional weight for the vehicle, in practice the Shelvoke & Drewry version was far more rugged in operation than the versions produced by some of the Company's rivals. For discharging the refuse a set of springs situated on the roof counterbalanced the weight of the rear door so that it swung clear of the discharging refuse. The Pakamatic introduced on Shelvoke & Drewry's new 'T' type chassis in 1960 was based on the French Rey design. 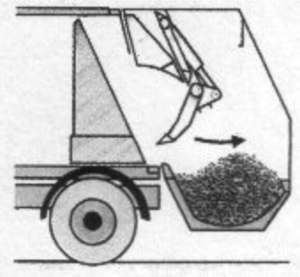 A reciprocating packer plate in the vehicle's rear hopper continuously moved refuse from the hopper into the body of the vehicle. The design of this packer plate ensured that the refuse continued to be consolidated towards the front of the vehicle. The packer plate was the only moving part in contact with the refuse. 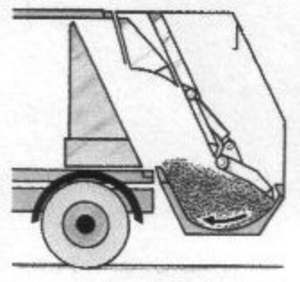 Diagram A shows the packer plate at the rear extent of its travel ready to push the refuse forwards. In Diagram B the packer plate is at the other extreme of its travel. Fresh refuse has accumulated on top of the carriage where it will fall in front of the packer plate when it reaches its return rearwards. Compression ratios of 2.5:1 were achieved. For discharging the refuse the body was tipped by a hydraulic ram with the rear hopper lifting to give a clear passageway for the refuse. Where discharge of the refuse took place on uneven or soft ground it was found that the instability of tipping the Pakamartic body was undesirable. So in 1969 the Paka Ejector became available. This utilised the Pakamatic compression system but a hydraulically operated plate inside the body moved rearwards to discharge the refuse in lieu of tipping. The hopper was lifted out of the way using hydraulic rams. 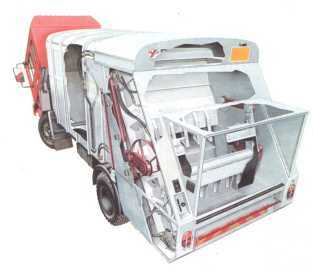 In 1971 Shelvoke & Drewry introduced the Revopak as a replacement for the Pakamatic. The compression sweeper mechanism is shown above in sectioned view. 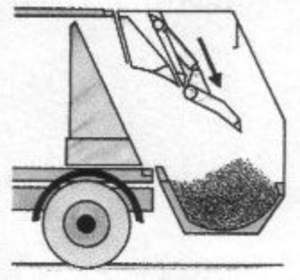 A bar carrying tines or teeth rotates to produce an elliptical orbit sweeping refuse from the hopper floor and forcing it between fixed tines at the front of the hopper. Once again the design was based on the French Rey design. The diagram above illustrates the loading cycle. The load was compressed against a moving bulkhead which later acts as the ejecting plate. The hopper was raised using hydraulic rams. Early examples of the Revopak utilised a hydraulic motor driving through a chain drive to rotate the mechanism. After a couple of years the motor was replaced by hydraulic rams in a weight saving exercise. The Revopak was highly successful in breaking down bulky refuse and compression ratios of 4:1 were achieved. NY Series Intapak 14' 0" wheelbase 16.0 tons GVW. 1976 saw the introduction of the Intapak, which had many similarities to the Revopak. But here the 2 cu. yd. hopper was loaded whilst the compression mechanism was stationary. When the hopper was full the operator actuated the hydraulic rams which elevated the hopper floor. With the floor raised a pivoting packer plate swept the refuse into the body against a moving bulkhead. Complete cycle time approx. 30 seconds. The intermittent packing cycle reduced running costs but the Intapak could only achieve compression ratios of 3:1. Shelvoke & Drewry's next version of an intermittent loader was the Maxipak which came into production in 1978. 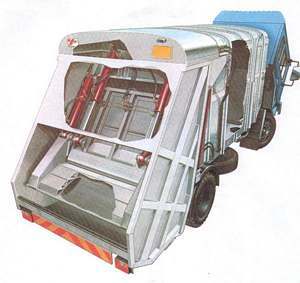 This type of refuse collector utilises two hydraulically operated plates. In the example shown below these are termed the sweeper blade and the packer plate. The sweeper blade is attached to the packer plate (often called the carriage plate.) 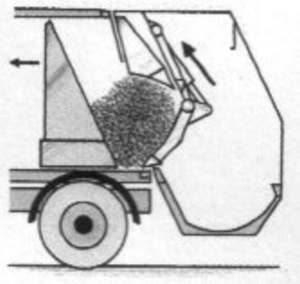 When the packer is lowered (3) the sweeper plate sweeps the hopper compressing the refuse, then the packer is raised (4) lifting the refuse into the body of the vehicle and forcing it against the moving bulkhead. From 1995 CE Health and Safety regulations insisted that intermittent open-back RCV's with a rave height of 1.4 metres or less Had to be made to operate so that a green press button lowers the Packer plate to leave a gap of 500 mm, then a second button has to be held down until the Packer plate has passed the loading rave. The cycle must stop when completed and have to be manually re-started over again. In 1983 Shelvoke started to offer the RouteChief intermittent loader built under a marketing agreement with Dempster Systems of the U.S.A. It incorporated the new squared off design of body. The RouteChief utilised a system that didn't require side channels in the hopper sides for the packer plate. This compaction system remained available along with the Maxipak until the company closed in 1991. 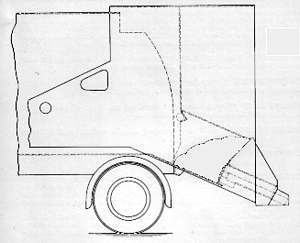 In 1960 the TW (8 tons 11cwt GVW) was introduced as a stop-gap measure. Available in 13' 0", 11'- 6", 10'- 9" & 8'- 6" wheelbase. Standard width 7'- 5 �" Narrow 6'- 10" Wide 8' 0"
The all new TY 13'- 0" wheelbase Overall width 8'- 0"
22.0 tons GVW PT on three axles. This gives some idea of the wide range of chassis available.